This lady's hair has around 37 different shades of auburn. You're never gonna believe this, but Sarah Michelle Gells is NOT dead! I totally thought she was dead! But no, she's alive and well and is now starring in a new TECHNO-DRAMA (called Ringer!) on the WB! And my wife is actually watching it! Obviously I don't know what a techno-drama is (I made it up), but this show is totally a techno-drama. SMG plays a lady who's actually a twin and is pretending to be her twin after her twin feigned committing suicide and ran away to Paris. AND HER TWIN IS PREGNANT BUT SHE'S NOT! So now that SMG (pronounced "Smigg") is back in the limelight on a television station that I thought only showed Bugs Bunns, let's check back in on the life of Sarah Jessica Michelle Parker Bowles Gellar! Okay, ready for this one? According to IMDB and Wikipeeds, SJMPBG is STILL married to Freddie Muniz Jr! And all this time I figured he and Ryan Phillippe were out sluttin' it up! Also, look at that midriff ... SHE MIGHT BE THE HOTTEST. Yeah, Frederick got her preggs too. And at first glance at this pic, I thought she was carrying the world's biggest cellphone ... until I remembered that I own the world's biggest cellphone. It's honestly so big! Apparently Sarah Michelle Obams really has a thing for dudes that look like her huzz. Here she is with good ole Novak (whose girlfriend might actually be the hottest!). Holy whip! This might be the best picture of all time - unless this photo was taken after Labor Day - 'cause in that case, YOU CAN'T WEAR THOSE PANTS LADY! Also, you can't tell from the picture, but she's actually sitting on the face of a 53-year-old mechanical engineer from Albany named Cliff Rhynesdale. Cliff paid $850 for SMG to kill him. And I would pay $850 to have Mariah beat me about the face and neck with that leather chair! This photo of Sarah Meshell N'Degeocello is for my boy @narb9 (you know what I'm talking about, Hart!). This is actually a promo shot for that techno-drama Ringer. See, Smeegs is one twin on one side of the glass and the sister is on the other. Kinda hoping for some Cruel Intensh girl-on-girl actsh with Smigg kissing Smeegs! 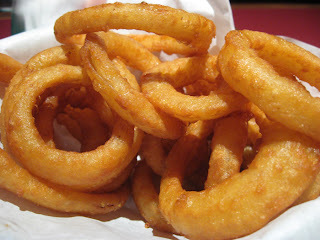 There is no excuse as to why I don't eat onion rings every day. NO EXCUSE! You into Wednesday's Wifey? Check out all previous WWs here. Orrrrrrrrrrrrrrrrr, check out this homemade recipe for onion rangsssssss. Onion rings should be state mandated at every meal. That midriff, however, makes me want to stop eating. Or her to start. I am so confused! Obviously, the #1 problem with onion rings is when you slurp the onion out of the ring prematurely and are left with just breading ... but I still sort of enjoy that.